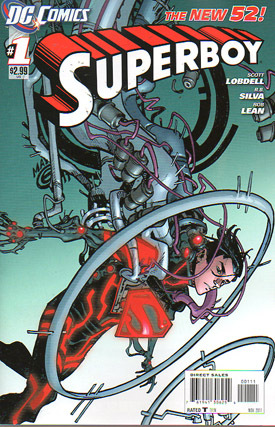 Superboy is a clone in a N.O.W.H.E.R.E. laboratory who is made up of human and Kryptonian DNA. The scientists decide to terminate the subject due to their inability to detect any brain activity. However the clone is indeed self aware. A red-headed female scientist is against his termination. The clone's natural defenses kick in and destroy most of the scientists. The red-headed scientist ("Red") is placed in charge of the new phase of experiments on Superboy, a virtual reality based on his own genetic memories. He finds himself a student in a small town school where he has vast knowledge and where he befriends a girl named Rose Wilson. He totally ignores the cries for help from a woman in a burning house, much to the concern of "Red" back in the real world. How can Superboy have Superman's DNA but not have the urge to help people... is his human DNA donor somehow to blame? "Red's" experiments are brought to a stop when a man called Zaniel insists he needs Superboy for a mission... to eliminate the Teen Titans. When the Superboy clone attacked those in the facility he was being housed in, Red (aka Caitlin) tries to cover for him, but he seems unconcerned. Now, Zaniel decides to have Superboy go on his first mission as a test before sending him after the Teen Titans. Rose Wilson and Superboy are to head into a facility known as Pen 51 and restore order to the criminal inmates who are rioting. Superboy is able to detect only three inmates, beings with shark-like heads. They're soon in a battle, with Superboy out-matched. 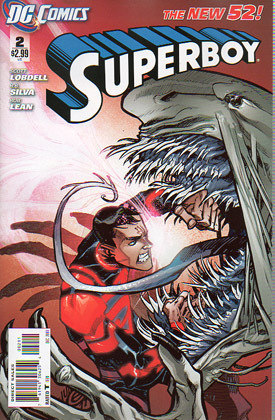 Rose kills one of the creatures, but the building is collapsing around their heads, so Zaniel gets Rose out of there, but leaves Superboy behind. Kid Flash arrives on the scene of a burning building, but only makes things worse when he tries to help out. The TV news reports on the incident and concerns about the increase in teenage metahumans. Red Robin is watching the news reports when he's attacked by agents of N.O.W.H.E.R.E. He escapes and heads to California where saves Cassie (aka Wonder Girl) from another of N.O.W.H.E.R.E. 's agents disguised as a policemen. Cassie denies her abilities to Robin until the pair are attacked once more. Elsewhere the N.O.W.H.E.R.E. agent releases Superboy... to eliminate the Teen Titans. Locked in a cell, Kid Flash communicates with a fellow metahuman captive called Danny, trying to think of a way to escape. Robin and Cassie meet up, and Robin wonders why N.O.W.H.E.R.E. haven't come after her yet. Superboy studies video footage of the Teen Titans. Red worries Superboy might kill someone. Robin finds a video on the internet and goes to a clothing store to question the girl. She ends up being the sister of this Skitter creature people have witnessed in Hollywood. Two teleporting brother bounty hunters confront Robin, but they vanish suddenly. 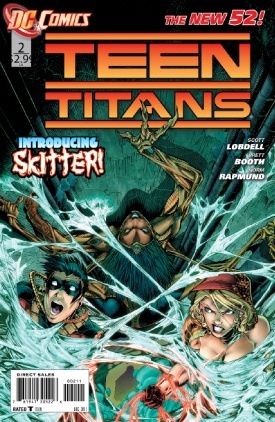 Robin comes across the Skitter creature (whose real name is Celine) and she attacks him, but he's saved by Cassie. Robin grabs the unconcious body of Celine. Kid Flash escapes his cell, but Danny is gone from his. A bright light from behind a door marks "Solstice" attracts his attention... within is a young girl who begs him to help her. 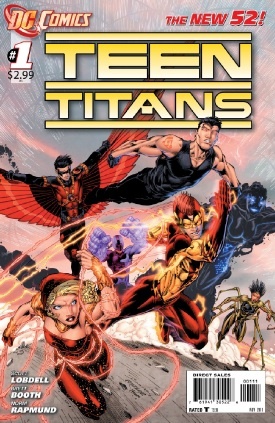 Here is a listing of the Superboy and Teen Titans monthly titles since their post-Flashpoint relaunch in September 2011. The Writer, Penciller and Inker for each issue are listed within the Comic Index pages, directly below each title's name and number.